A Limited-Time Offer on a Lifetime of Memories. Most moments come and go, but some rise above the rest to become memories that stay with you for years to come. When you explore the Canadian Rocky Mountains by luxury rail, your journey will be full of moments like these—from the small touches of impeccable service provided by our Hosts to the awe-inspiring vistas that stretch out all around you. For a limited time, when you book a qualifying 2019 package, you’ll receive a credit of up to $500* per couple with our Stay and Play offer. Use it towards extra hotel nights, sightseeing & more. Rocky Mountaineer offers an unparalleled experience onboard its luxury train as it takes you through the Pacific Northwest and Western Canada. From Vancouver and Seattle, to the mountain towns of Banff, Lake Louise and Jasper, the all day-light journeys take you to captivating destinations. Stepping onto the bi-level glass-domed cars of GoldLeaf Service is a luxurious experience onto itself. With sprawling windows on the upper level, and an elegant dining room serving gourmet meals with picture windows on the lower level, you won’t miss any of the dramatic scenery. SilverLeaf Service offers optimal viewing from oversized windows so you can soak up the stunning scenery. With a selection of regionally inspired menu options served right at your seat, you receive the royal treatment. Rocky Mountaineer takes you on a journey alongside rivers, through quaint mountain towns, and within arms-reach of snowcapped mountains. Along the way, you will have a front-row seat to fleeting wildlife, including moose, elk, and soaring eagles. 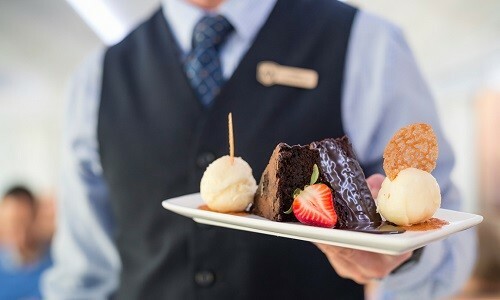 Gourmet cuisine accompanies the majestic scenery and award-winning service. Before each season, our Executive Chefs reimagine a menu inspired by the bounty of the passing regions, highlighting local ingredients. 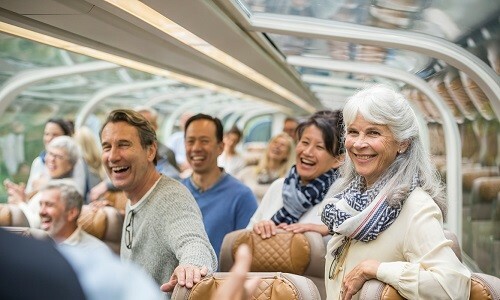 * Terms & Conditions: Offer applies only to new 2019 bookings made by March 29, 2019 for qualifying Rocky Mountaineer packages booked in GoldLeaf or SilverLeaf Service for travel during the 2019 Rocky Mountaineer season on selected dates. Added value credit (“Credit”) must be requested at the time of booking and will not be automatically allocated or retroactively added. Guest’s selection of specific Credit must be made at the time of booking and an amendment fee of $50 CAD per booking will be charged for changes after the booking has been confirmed. Deposits are required at the time of booking and full payment of the balance must be made 60 days prior to travel. Offer applies to single, double, triple or quad package prices. 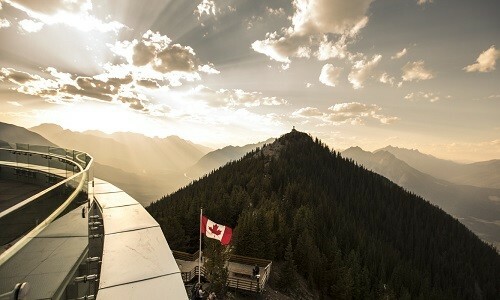 A maximum Credit of $250 CAD per adult ($500 CAD per couple) for qualifying packages of five days or more. 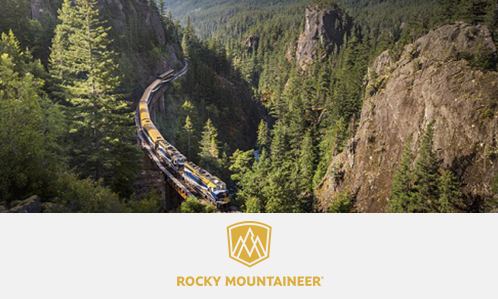 Credit can only be used towards the purchase of specified additional services offered by Rocky Mountaineer and cannot be used against the price of the purchased package or to upgrade rail service. Offer cannot be combined with any other offer, is not applicable to child prices, 2 or 3-day rail-only bookings or group tour bookings, has no cash value, is non-transferable and cannot be deferred to a later trip. Offer is capacity controlled and may be modified, withdrawn or amended without prior notice. Additional conditions apply.